Imperfectly Painted: Savina Morning Glory...Gray Jelly?!? Morning Glory is a gray with a touch of blue jelly. This around 3 coats. This built up nicely into a great jelly! I don't know about any gray jellies, so I'm excited about this. This isn't as "jelly-like" as some of the colors in OPI Texas, but it definitely has that "squishy" look to it. This color is a definite win! I will be getting a second bottle to throw in a giveaway soon, because I think this greatness needs to be shared! You can get this color at Nordstrom Rack or 8ty8 Beauty (the bottle pic it shows on 8ty8 is so inaccurate Morning Glory isn't teal!). I have also posted my first blog sale. This is US only. Please be sure to check it out! Oh this is pretty! I've never heard of this line. Is it relabeled China Glaze? WOWOWOWOWOWOW! I looove anything Grey and this is so totally up my alley. I have a thing for Grey like u do for Golden Shimmers! I love the idea of a grey jelly! 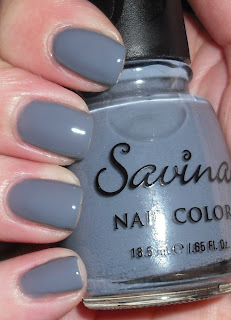 I've never seen the brand Savina before..
Looks like I need to hit up Nordstrom Rack tomorrow. What a coup!